Got the hots for spicy dishes? Then this should be on your foodie bucket list! Not for the fainthearted, these dishes are going to set your taste buds on fire. While the rest of the world might throw a fit over our use of chilly, but for us Indians, we embrace it. Many of us, in fact, live for those dishes that have us sweating, our eyes tearing up, and for puffs of smoke to billow from our ears. If you are one of those, this article is just for you. For those who like to keep it hot, here’s a lowdown of dishes you must try to satiate your cravings. And remember, while your taste buds crave hot dishes, your stomach has to deal with the steep price for that spicy love affair. Make sure you get packets of ENO Cooling for fast cooling relief from acidity, through its refreshing variants of lemon and mint. Worry no more and step out to satiate your cravings with Mumbai’s spiciest dishes. We consider Misal Pav as a staple breakfast option; more so than Vada Pav. If the inner Mumbaikar in you has a problem, head to Hotel Pooja in Santacruz and try their Misal Pav albeit a twist. Do remember, there’s no way for you to stop after just one bite. Though, you may have to look past the size of the place to enjoy this spicy take on the famous Misal Pav. #LBBTip: Don’t let the pav ignite fire in your tummy! Make sure you’re carrying a packet of ENO Cooling in its yummy mint flavour, and get fast cooling relief from acidity during your spicy food trail. You read that right! Bhut Jolokia is only the spiciest chilli in the world. And you know life is great when burgers are flipped using this spice. Even though the burger in not crazy-spicy, it still scores high on the ooh-aah quotient, and at INR 150 this surely is a must try. Pulli Manchi is traditionally a Mangalorean delicacy and will have you huffing and puffing. This is a proverbial Shaadi ka laddoo scenario and if such, you are better off eating this. Jai Hind Lunch home serves some mean Pulimunchi. You can go for either Bangda or Pomfret, both of which are super yummy! #LBBTip: While the rich flavours of the dish will get you grinning ear to ear, we don’t want you to deal with the after-effects of an upset stomach. Don’t forget to carry a satchet of ENO Cooling in the Lemon flavour, and add some much-needed zesty taste to your palate. 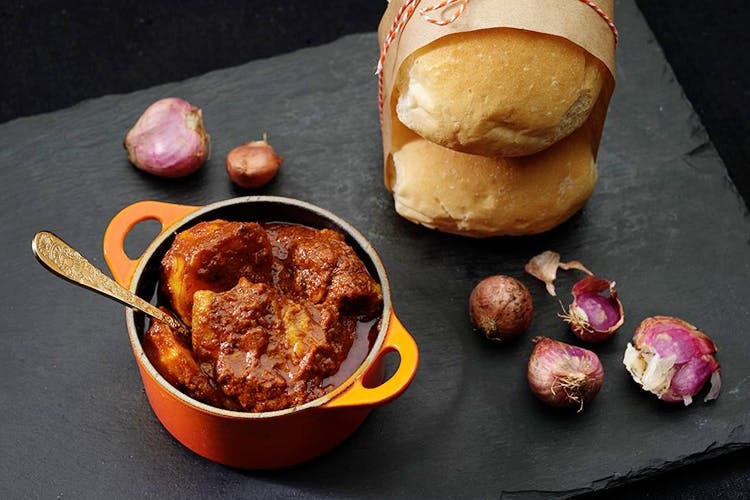 Vindaloo is one of the spiciest dishes that you will ever have on your table. Mixed with spiced chili, served in red curry vindaloo sauce, with vinegar to add that extra tanginess, surely Pork Vindaloo is among the must-haves. Try this at the Curry brothers on Lower Parel with extra soft Pav on the side. We love ramen. And if you too are a fan, then the red chili ramen at Fatty Bao is to die for. Cooked in chili broth with minced chicken, sautéed leeks, scallion and soft-boiled eggs, the spicy red chicken ramen will have you returning to the restaurant, for more! Want to douse that inevitable fire from spicy food? Make sure you keep a packet of ENO Cooling at hand so you can cool off the burning sensation and get instant relief from acidity! Available in 2 flavors – lemon and mint, the fresh, zesty taste will get you feeling better in 6 seconds. After all, you shouldn’t need to shy away from adding spice to your life and palette, especially with these amazing dishes! Didn’t include your favourite spicy dish? Do tell us in comments below.